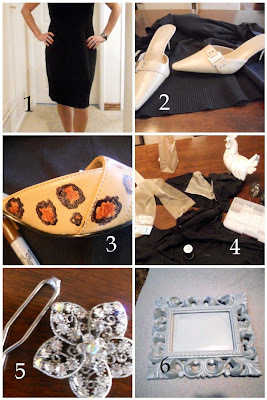 The one where I ruin a dress, a pair of shoes, and almost do something horrible to a wooden chicken. A few weeks ago I was in the One Month To Win It crafting contest. There were only 3 of us left in the final round. The challenge? Re-purpose an article of clothing or an accessory. Oh Crap. I had all sorts of wacky ideas for the challenge. Unfortunately all of my ideas were outside the scope of my particular skill set. I did manage to learn something about myself in the process: If I try to do something based on how I think someone else would do it… it doesn’t work. I learned that my real creativity doesn’t really kick in until I am trying to solve a problem. And I created lots of problems…. #1) I took a perfectly good dress, hacked off the bottom third, then cut it up the middle, thinking I would make it into a short sleeve cardigan or add cute embellishments or something. FAIL. #2 and #3) I took a perfectly good pair of shoes, drew cheetah patterns on them with Sharpies and planned to glue tiny beads all over them. EPIC FAIL. #5) I found a broken hair clip I had been meaning to try to fix. #6) I found a tiny frame that had been floating around in my craft supplies. I surveyed the damage and realized all I had to show for my time was a pile of dress fabric, a ruined pair of shoes, a tangle of jewelry …and a traumatized chicken. 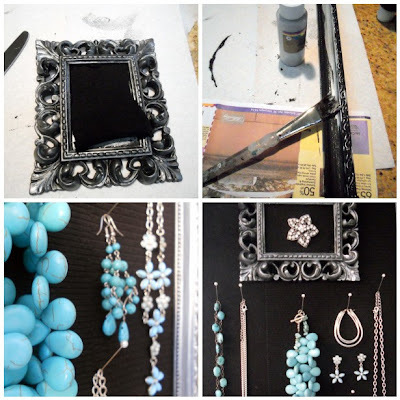 I made a jewelry organizer/wall art. I took the little frame and painted it black, then put a silver wash over it. Then I tucked some of the black dress fabric into it. I did the same thing for tall frame that had held a photo collage. I took the cardboard from the back and wrapped it in the rest of the dress fabric. I hot glued the flower from the broken hair clip into the little frame, then secured the little frame inside the big frame with floral pins. I used the floral pins to hang some of my favorite turquoise silver costume jewelry pieces. Because it’s color coordinated, it doesn’t look chaotic to my eye. In the end I came in third. (Or as I like to think of it: Last in Round 4) However, I am still liking the jewelery holder and it is still hanging in my bathroom. You crack me up!! I actually laugh out loud when I read your posts. Just one more thing to make my husband believe ever since I started my blog I really have gone crazy! I love your jewelery organizer! and your jewelery : ) What a great way to display it. Out of all the fails, you were able to create something useful and lovely. I think you won after all. I have a box of failed projects and an even bigger one of failed doll fashions…A big part of the creative process is what we learn along the way…I actually get bored with creating if I do not learn something new while I am working on a project…no fun or challenge in it. Congrates on making it thru to the next round. Very funny! But you did come up with a very cute project in the end. And, you made the finals. I’d say that’s impressive! So glad that chicken is in therapy!!! Oh my! Loved reading this & not feeling so bad about all my crafts gone wrong. Visiting from SBLC’s blog hop. I already follow you & adore your projects (and hate mail commentary)! This made me laugh! I am glad you were able to salvage most if it-and your organizer looks fabulous! I think your chicken will be OK-though he may need some therapy. SO pretty!! The jewelry is too!! great minds think alike! I made something similar in high school to hold all my jewelry!! I love it! you did an awesome job babe! oh yes and send the chicken my love! Great idea…looks like you have some nice jewelry to-boot!